I love a good soup for lunch or dinner. Sometimes, it just hits the spot. It’s even better if I can make a giant pot and freeze it for later. This recipe is perfect for sharing or freezing, making over 15 servings of soup, depending on your appetite. 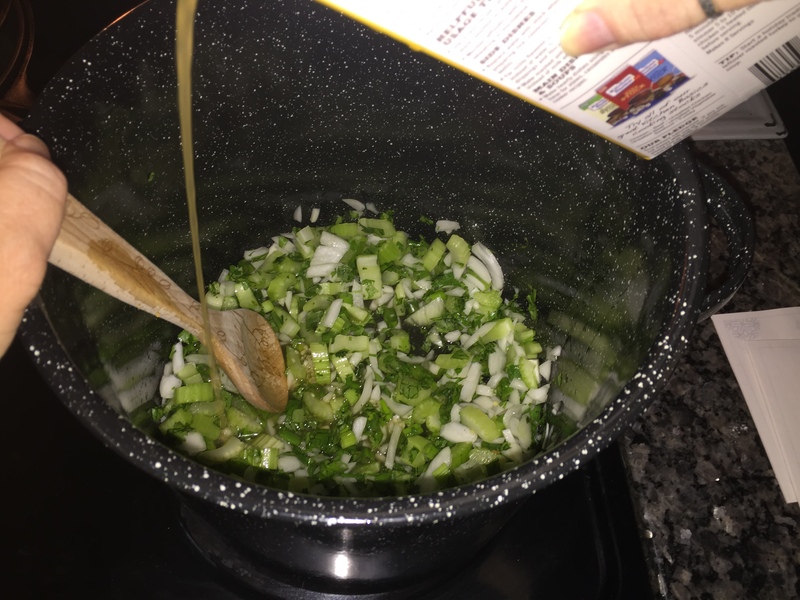 The best thing about this recipe is that it is chock full of vegetables, and with a broth base, it’s a low cal AND delicious meal. Double bonus, since there is a lot of chopping, Cowboy and I make this one side-by-side splitting up the chopping duties. The hardest part? Waiting the hour for it all to simmer together. Give it a whirl and let us know if this soup hits the spot. 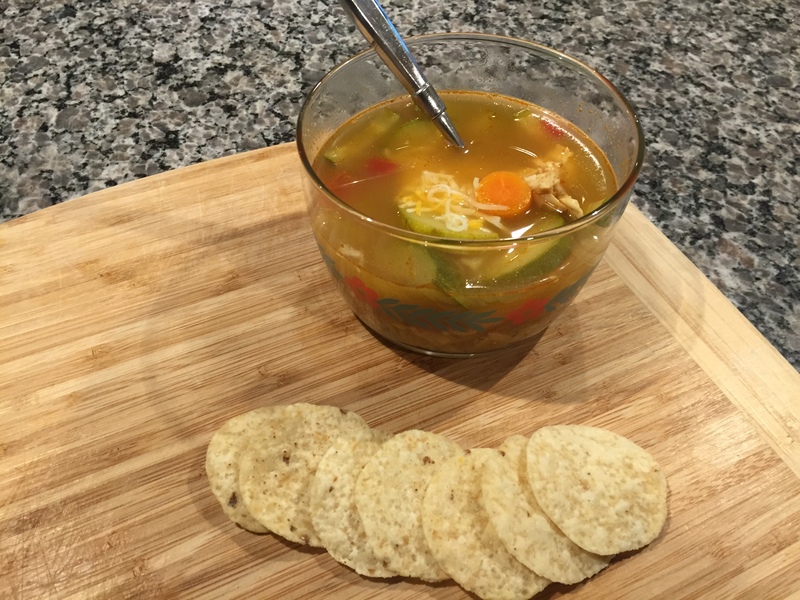 The Source: The original was in Harvest Gifts church cookbook from Saint Ann Catholic Parish in Coppell, Texas, and was called Tortilla Soup with Chicken. However, I’ve altered it significantly over time. Proof again that church cookbooks are the best. 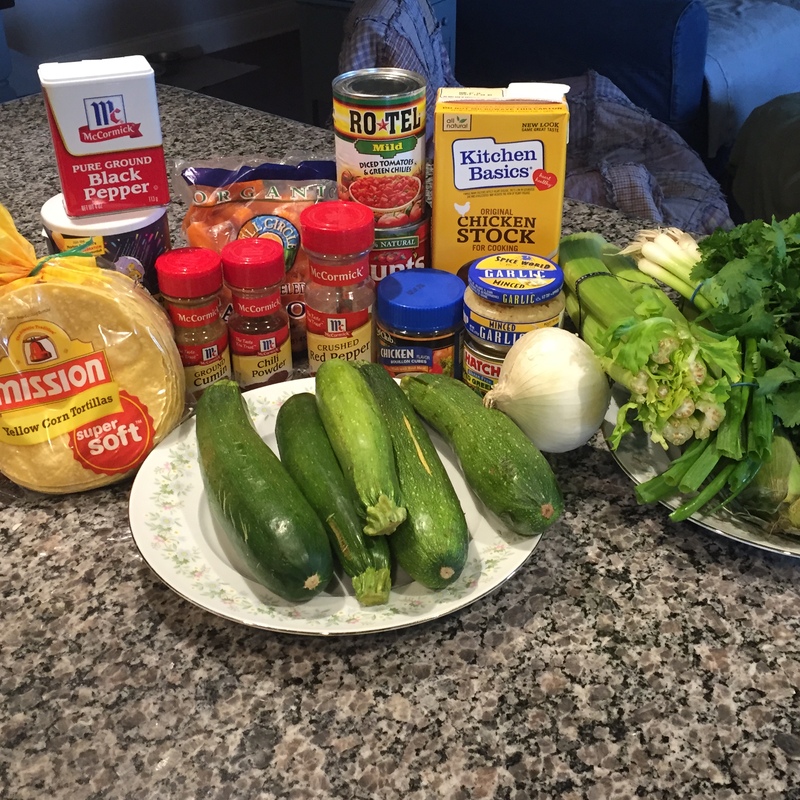 Yep – this recipe has a lot of ingredients. But it is oh so worth it as the rich flavors come together for one of my all-time faves. In a large pot, bring chicken to a soft boil, approximately 20 minutes. Reserve broth for adding into soup. Shred or dice chicken, your preference. 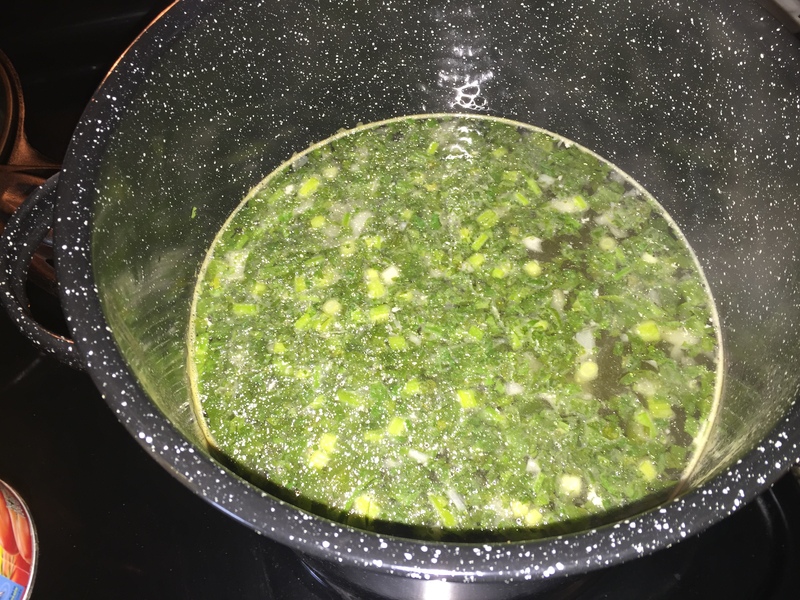 In a large stock pot, at least 12 quarts in size, add in the chicken stock, onions, celery, green onions, garlic and cilantro. Simmer until tender. About 5 to 7 minutes. Adding in the broth. This is a 12 quart stock pot. noticed how deep the soup currently is. Once all broth is added, the pot is about half full. Add in ingredients from bouillon cubes through tortillas. Stir. Add in chicken. Cover and simmer at least 1 hour. Longer is okay. Stir occasionally. Getting all of the ingredients ready to make one monster batch of soup. Make sure to stir, stir, stir. Notice the soup is now almost at the top of the pot. Adding in the tortillas. Push them down into the mix with your spoon. They will sink. Serve immediately. Top with tortilla strips and cheese, if desired. The soup has a vibrant, spicy broth and is loaded with veggies. Make sure to stir the whole pot before serving. The chicken will be on the bottom of the pot. Sometimes I make fresh rice, either white or brown, and place 1/2 cup of cooked rice in a bowl and pour the soup over it. This makes it almost like a stoup, as Rachael Ray would say a cross between a soup and a stew. I freeze this in quart size bags. It lays flat for easy storage, and it makes a perfect meal for two or side dish for 3 to 4 in a pinch. Lay filled bags on a cookie sheet for easy transport.